In the previous article (https://guruparamparai.wordpress.com/2012/09/30/ponnadikkal-jiyar/) we discussed about ponnadikkAl jIyar. We will now continue on with other AzhwArs and AchAryas. 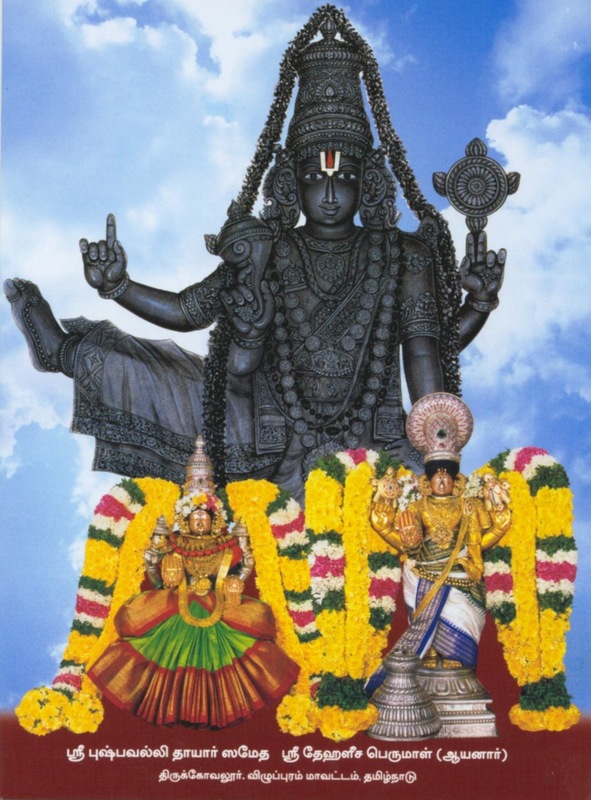 In this article we will discuss the vaibhavam of mudhalAzhwArgaL (poigaiyAr, bhUthathAr, peyAr). poigai AzhwAr was born in a pond near thiruvekhA yathOkthAkAri temple. He is also known as kAsAra yOgi and sarO munIndhrar. bhUthathAzhwAr was born in a pond near thirukkadalmallai sthalasayanap perumAL temple. 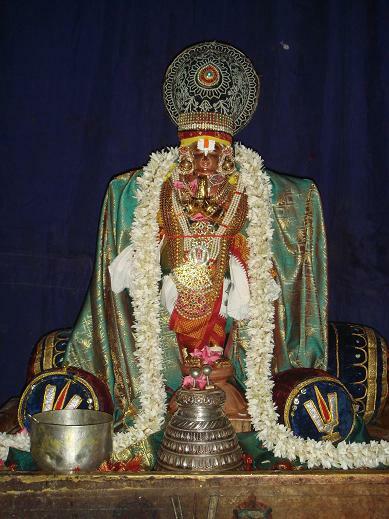 He is also known as bhUthahvayar, mallApuravarAdhIshar. 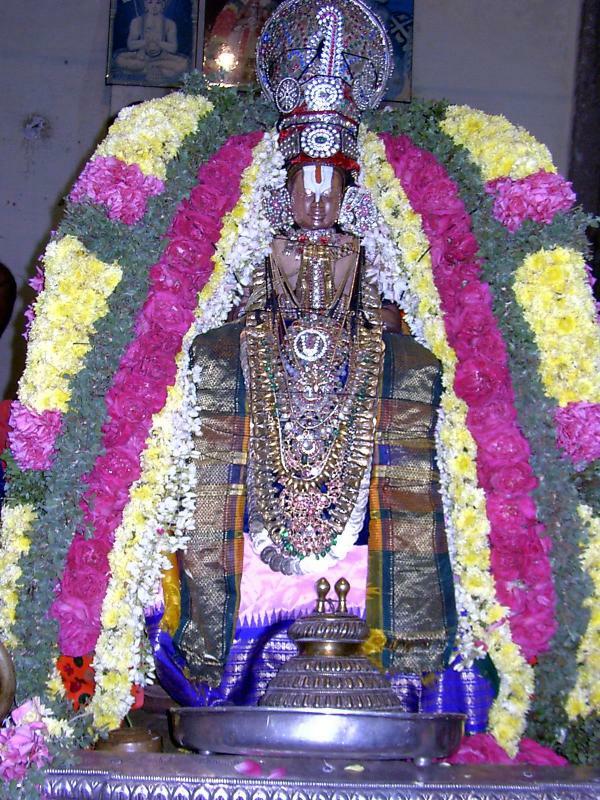 pEyAzhwAr was born in a well near thirumayilai kEsava perumAL temple. He is also known as mahathAhvayar, mayilApurAdhIpar. All the 3 AzhwArs are usually glorified together because of the following reasons. They were all born a day after each other in sequence – poigaiyAr, bhuthathAr, pEyar. They were born in the time period between the end of dhvApara yugam and the beginning of kaliyugam (yuga sandhi – transition period – see in the bottom for details). They were all ayOnijars – one who is not born from a human mother. They all appeared from flowers by the divine mercy of emperumAn. They were attached to emperumAn right from their birth – they were fully/divinely blessed by emperumAn and were fully enjoying bhagavath anubhavam throughout their life. At some point in their life, they meet each other and from then onwards they stayed together and they travelled together to various dhivyadhEsams/kshEthrams. They are also called “Odith thiriyum yOgigaL” (ஓடித் திரியும் யோகிகள்) – the yOgis who are always doing pilgrimage. All the 3 AzhwArs were born in different locations and enjoying emperumAn thoroughly. emperumAn who considers his adiyArs as his life (gIthai – jnAni thu Athma Eva mE matham) wanted to see them all together. So he made a divine arrangement to bring all 3 of them to thirukkOvalUr in the night time. poigai AzhwAr lit the place using the world as a lamp, the ocean as the oil and sun as the light. bhUthathAzhwAr lit the place using his love as lamp, his attachment as the oil and his mind as the light. pEyAzhwAr, being helped by the other two AzhwArs, sees the glowing beauty of emperumAn who is with his pirAtti, thiruvAzhi and thiruchchangu and performs mangaLAsAsanam for that sErthi. Thus they enjoyed the thirukkOvalUr Ayan and many other archAvathAra emperumAns together during their time in the leelA vibhUthi. pAlEy thamizhar (1.5.11) – nampiLLai identifies ALavandhAr’s nirvAham (conclusion/statement) here. He says nammAzhwAr is glorifying mudhalAzhwArgaL here who were the first to bring out the glories of emperumAn in the sweet thamizh language. inkavi pAdum paramakavigal (7.9.6) – Here, nampiLLai identifies that mudhalAzhwArgaL are also known as “chendhamizh pAduvAr”. He also identifies that AzhwArs were so expert in thamizh, when poigai AzhwAr and pEyAzhwAr asked bhUthathAzhwAr to glorify emperumAn – he spontaneously sung the glories of emperumAn like how a male elephant fetched the honey for the female elephant immediately when asked by the female elephant (this elephants incident is explained by bhUthathAzhwAr in “perugu madhavEzham” – iraNdAm thiruvanthAdhi – 75th pAsuram). palaradiyAr munbhrauLiya (7.10.5) – nampiLLai beautifully brings out the thiruvuLLam of nammAzhwAr here. 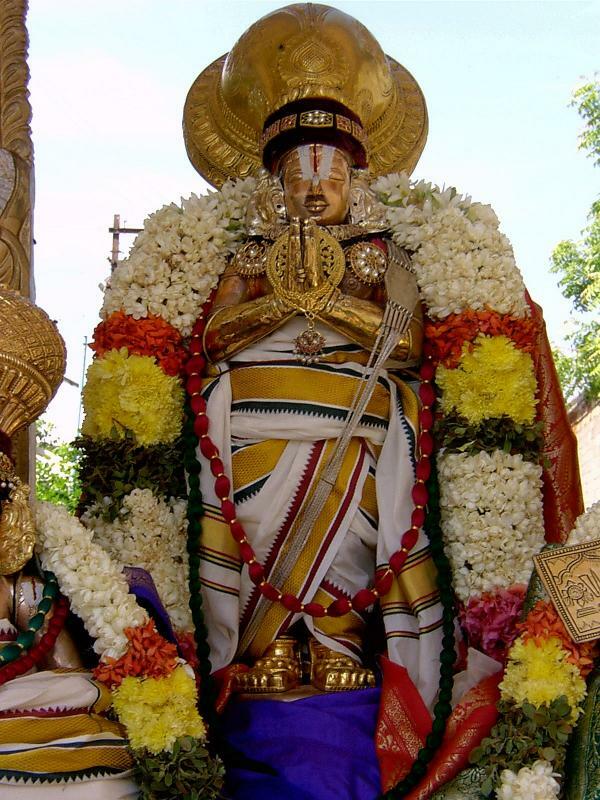 nammAzhwAr says in this pAsuram that emperumAn blessed him to sing thiruvAimozhi instead of great rishis like sri vEdhavyAsar, sri vAlmiki, sri parAsarar and mudhalAzhwArgaL who were expert in thamizh. chenchorkavikAl (10.7.1) – nampiLLai refers to mudhalAzhwArgaL as “inkavi pAdum parama kavigaL”, “chendhamizh pAduvAr”, etc and identifies that they are ananya prayOjanargaL (one who glorifies emperumAn without expecting anything in return). mAmunigaL identifies how they became to be known as mudhalAzhwArgaL in his upadhEsa rathina mAlai pAsuram 7. 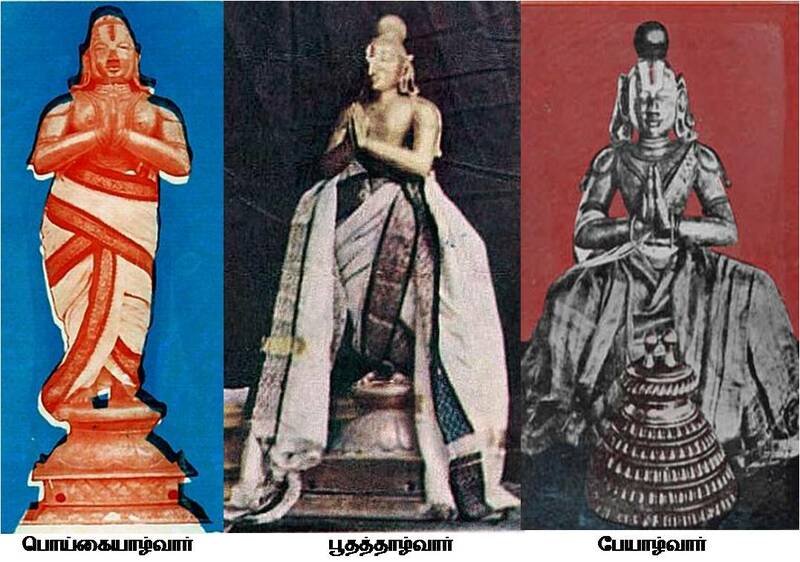 These 3 AzhwArs appeared before the other 7 AzhwArs and benedicted the world with their divine thamizh pAsurams. It is because of this glorious act they became to be popularly known as mudhalAzhwArgaL. In the vyakyAnam, piLLai lOkAm jIyar brings out some beautiful aspects. He identifies that mudhalAzhwArgaL are like praNavam which is always considered as the beginning. He also identifies that these AzhwArs were born during the dhvApara-kali yuga sandhi (transition period) and thirumazhisai AzhwAr appeared along the same time. Subsequently, in the beginning of the kaliyugam, other AzhwArs appeared one after the other. They laid the foundation for dhivya prabhandhams in the great dhrAvida bAshai (thamizh). mAmunigaL also brings out the glories of ippasi – thiruvONam, avittam and sathayam as these dates became so popular after the appearance of the mudhalAzhwArgaL on these days. As identified in the thirunedunthAndagam vyAkyAna avathArikai by periyavAchAn piLLai, mudhalAzhwArgaL are focussed on emperumAn’s parathvam. That is why, they are often glorifying thrivikramAvathAram. On the other hand, they also glorified many archAvathAra emperumAns since by nature all AzhwArs had great attachment to archAvathAra emperumAns. Their archAvathAra anubhavam is already discussed in here – http://ponnadi.blogspot.in/2012/10/archavathara-anubhavam-azhwars-1.html. yathIndra matha dhIpikai explains various technical concepts in our sampradhAyam and is considered as one of the most authentic sources for our sidhAntham. In this, kAla thathvam is explained in detail and we see the definition of the various yugams and their sandhi periods. brahmA’s day is made of 1000 chathur yugams. His night is of the same length but no creation during that time. brahmA lives for 100 years of 360 such days. between krutha yugam and thrEthA yugam, there is a sandhi period of 700 dhEva years. between thrEtha yugam and dhvApara yugam, there is a sandhi period of 500 dhEva years. between dhvApara yugam and kaliyugam, there is a sandhi period of 300 dhEva years. between kaliyugam and the next krutha yugam, there is a sandhi period of 500 dhEva years. Also, in 1 day of brahmA, there is 14 manus, 14 indhrans and 14 saptha rishis (all of these are posts that are given to certain jIvAthmAs based on their karmA). This entry was posted in AzwhArs, other AchAryas and tagged poigai bhutham pei alwars thirukovalur idai kazhi on October 22, 2012 by sarathyt. adiyen…..very lucid…excellent reading material….you stick not only to Guruparampara Prabhavam, but dwell in Eedu, which enriches the value of the stuff.